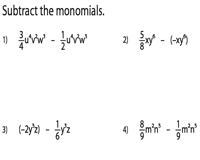 This set of printable worksheets consists of subtracting monomials that are offered in multi-levels based on their coefficients. Over 25 worksheets are included for thorough practice. 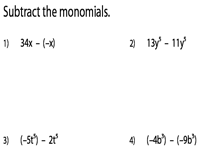 Subtracting monomials are recommended for high school children. Sample our free worksheets and subscribe for complete access. These level 1 worksheets include single variable expression, and the coefficients of the variables involved are integers. Subtract the monomials to identify the difference. 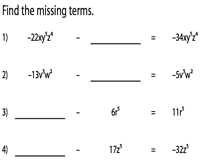 Level 2 worksheets contain monomials with coefficients in integers or fractions. 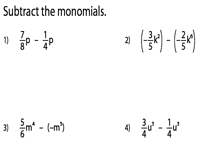 Simplify the coefficients of the like terms to subtract the monomials. 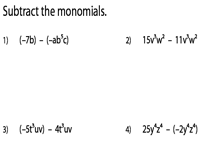 This set of worksheets involves the monomials containing two or more variables. The coefficients of the monomials are in the integers. Subtract and find the solution. Each worksheet contains ten problems subtracting monomials. The problems are arranged in horizontal format. Simplifying coefficients might be a little harder at this level. Find the missing monomials to complete the subtraction sentence. Use answer key to validate your response.